The CLASSIC STRAP adds a touch of class to any camera or binocular. The tailored design is made with soft, durable neoprene combined with a unique 'Comfort-Stretch' binding. 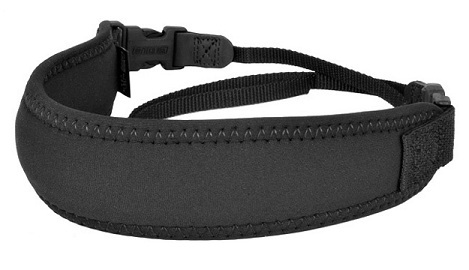 While the neoprene evenly distributes the weight, the unique binding gives added support in order to eliminate shoulder and neck fatigue. This combination makes your cameras and binoculars feel 50% lighter and 100% more comfortable. The quick disconnects give the strap an added feature as they can be reattached together to form a small carrying handle when the shoulder strap is not in use. You get two straps in one! CLASSIC STRAP is sure to be a 'classic'!